Hello, all. 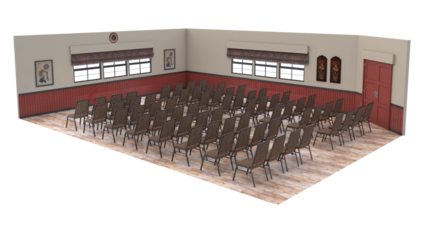 In order to make planning meeting events easier and more productive for our guests, we’ve added a 3-D Floorplan widget to the Paso Robles Inn‘s website. 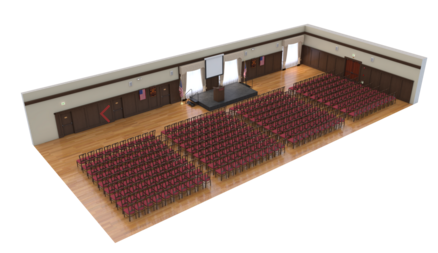 This visual tool makes it easier to see the amount of people that can comfortably fit in one of our four meeting spaces, and also shows a variety of different seating arrangements and room configurations. This blog goes along with the widget, and will explain different meeting configurations and their respective benefits, allowing you to make the best choice of configuration for your unique meeting. 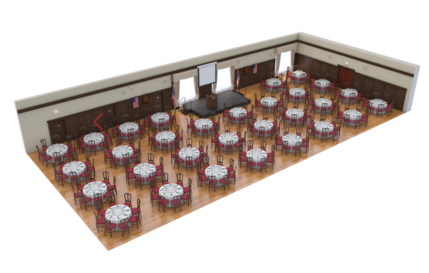 The Paso Robles Inn can accommodate 18-250 people for banquet seating in the Grand Ballroom, Paderewski Room, or Matador Room. This is the best set-up if meal service is included and/or if group participation is valued. It is ideal for small team, work group, and committee meetings, because it facilitates group interaction and discussion. Small-groups will work together well in this kind of setting, and can be beneficial for problem solving or brainstorming ideas. Theater seating involves rows of chairs facing the center stage and display. 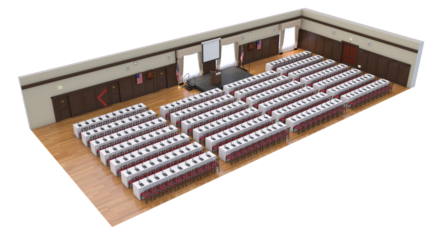 At the Paso Robles Inn, we can accommodate up 350 people in theater seating. This configuration is ideal for maximizing the amount of participants in the meeting. It works well if the presentation involves speakers, a performance, audiovisuals, or panel discussions. The structure of the room is not ideal for taking notes or getting group interaction, but is much more appropriate if you’d like the guests to be a traditional audience rather than a participatory group. The Classroom configuration involves rows of tables facing the front, mimicking a traditional classroom. At our hotel, we can accommodate up to 300 people for the simple arrangement. It’s an excellent setup for a teaching format, which could include speakers, panel discussions, and extensive note taking. While it is not as conversational as other setups, it is appropriate in a teaching context where there’s a lot of information to communicate to the guests. U-Shape is appropriate for smaller groups, and the Paso Robles Inn can accommodate about 34 people in this shape. Groups with a discussion or teaching format are appropriate, as well as training sessions and group communication. This set-up is very open, giving participants a sense of freedom and space. Additionally, there is no concept of preferential seating because all participants will have an equally good view of the presentation. 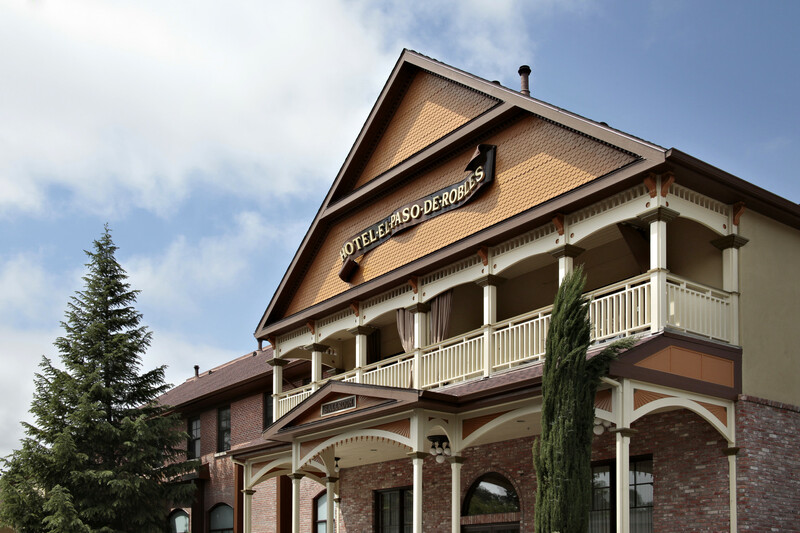 Perfectly situated in between Los Angeles and San Francisco, the Paso Robles Inn is an ideal destination for work retreats. 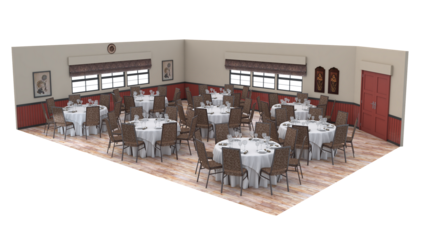 Peruse our website and the 3-D Widget to explore the four meeting rooms that we offer at the Paso Robles Inn. We can accommodate a wide variety of events for varying purpose, and would be thrilled to help you host your event.